Hi, it’s Nina of Fliegfederfrei. I live in Switzerland and I have a one year old daughter and a two year old dog. 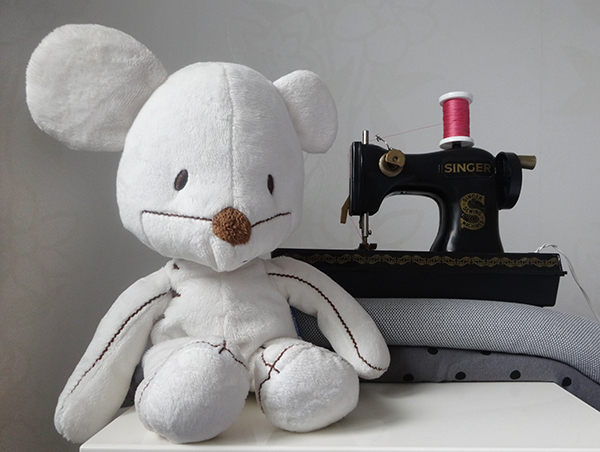 I’m a sewing addict and I spend every free minute in front of my sewing machine. Today is my turn to show you my Christmas inspired Florence. When Olu first asked me to be part of this tour, I fell instantly in love with the pattern. On closer inspection I realised it started at size 2Y. What was I to do? My 1 year old daughter would probably be too small. I sewed a test version and as expected it was a bit too big. That was when I hit upon the idea to sew a Florence coat instead of a blouse. And I’m so happy with the result. It suites her like a charm. Just hop over to Fliegfederfrei to see all the details. Hello! I’m Tasha–blogger at Glitter+Wit, small-business owner of handmade goods under the same name, 27-year-old wife of seven years, and mother of two adorably feisty children. I live in Southwest Missouri, USA. Sewing is pretty much my all-time favorite thing, though when I do take a break you can catch me binge-watching my favorite television programs. I’m currently preparing for my first craft show, but I just had to make time for the Florence. See the rest of my daughter’s red+green shirt on my blog (styled two ways) on my blog, and keep up with me on Instagram for more making madness. This entry was posted in Coats, Tops and tagged fliegfederfrei, Florence Christmas Blog Tour, glitter and wit, MadeIt Patterns. Bookmark the permalink.